The inaugural meeting of the new FRIENDS OF OUR TORTOISES GROUP : 'FOOT' was held on the 15th March and was attended by 8 people, including Cape Nature and the Breede River Gazette. The group will meet again on 18 April 2012. 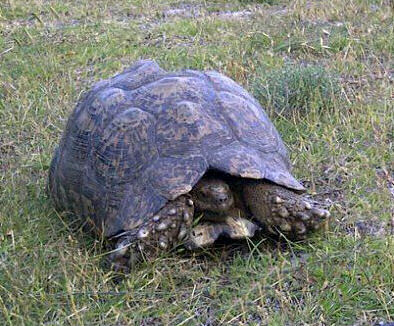 UPDATE: 4th April - A suitable local location for the care & rehabilitation of injured tortoises has been found. The first order of business is to construct an enclosure - preferably of dry-packed local stone plastered on the inside. We can source most of the building material on-site but need some donations of cement, and timber / steel for gate construction etc.